Sure, we all know what wardrobe essentials for work professional women are supposed to have in their closets, but if you’re buying one for the first time or replacing one you’ve worn into the ground, it can be a pain to find exactly the right incarnation in stores. Plus, when you’re a working mom, the focus often becomes machine washable clothes and kid-friendly fabrics and prints. In CorporetteMoms’ “The Hunt,” we search the stores for a basic item that every woman should have. 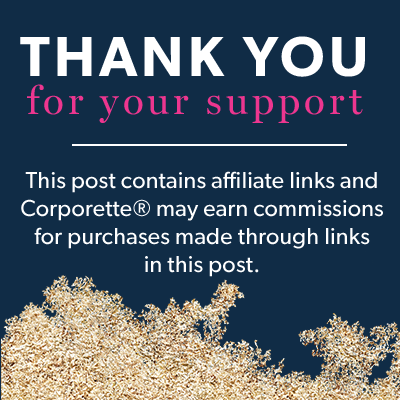 A few weeks ago we rounded up modern blouses for under suits over at Corporette, and there were so many great machine washable options, I thought I’d round them up specially over here! What kind of shirts, blouses and tops do you like to wear the most — and do you gravitate towards them because they’re machine washable, easy-care, comfortable, or something else, like nursing- or pumping-friendly access? 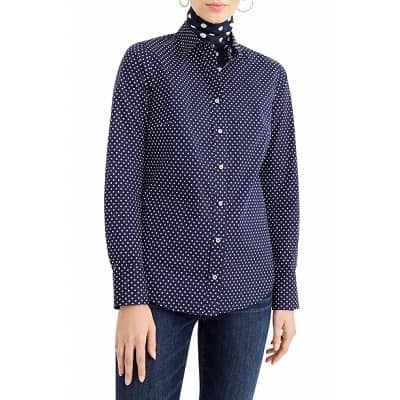 A synthetic popover blouse like this one is another reader favorite for a super easy top to wear to work — it’s usually fine without ironing (unlike similar silk options), but the fact that you don’t have to worry about gaping buttons or fussy collars makes it very versatile. 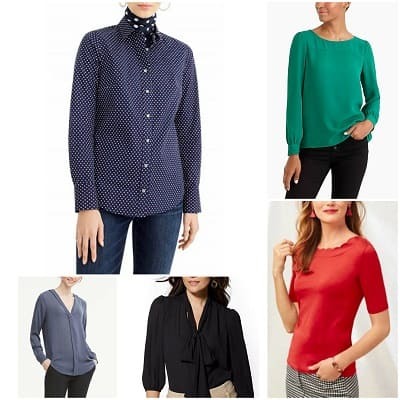 The pictured top is from J.Crew Factory (and comes in multiple colors and prints right now for $19-$35); also check out these options from Hinge and Express. Mixed media blouses can be the best of both worlds — they’re usually a polyester on the front and a jersey knit (like a t-shirt) on the back. They’re stretchier, and they wash well — but in my experience they look a bit worse for wear sooner, possibly because I’m more inclined to put them in the dryer (whereas with synthetic blouses I always just hang them up to air dry). The pictured one is $59 at Loft (and today they have a stacking promotion, where the more items you buy the higher your discount). If you’re looking for easy-care blouses, don’t automatically discount the super traditional button-front dress shirts because many of them are machine washable and can look great with the right dryer/airdrying combination (15 minutes in the dryer to get the wrinkles out, then hang to dry). In my experience, the ones that are no-iron or have a high component of stretch works the best if you’re trying to iron your clothes less — the pictured one is from J.Crew, but also check out Brooks Brothers, Ann Taylor, Foxcroft, and Express. Another idea to consider here, particularly if you just want to layer a collar beneath dresses or sweaters: the dickey or collar. They’re making a comeback, with high and low end options to choose from. Readers, how about you — what are your favorite machine-washable tops to wear to work like blouses, dress shirts, and elevated t-shirts? I absolutely love the Angela wrap top from Amour Vert (true wrap, so you can use it for nursing). I do have to wear a cami under it. I have a very similar wrap top from Ann Taylor Factory, of all places, which is a true wrap but somehow perfectly draped on me and I don’t have to wear a cami underneath. Both machine washable, knit, and don’t need to be ironed. I’d love any recommendations for machine washable cowl neck or draped neck tops. I got 20% off and still think it was pricey, but it fit so well and I wear it a lot, so I guess it’s worth it! I also really only wear things that can be washed and dried, and poly doesn’t work well for me (doesn’t breathe), and this checked those boxes. I LOVE Amour Vert and get stuff on sale there or on Poshmark/Ebay when I can. I’m wearing a jumpsuit from there to work right now. I prefer their modal/cotton stuff to their “ethical silk” because I have messy toddlers, but I find their stuff to be really comfy and I like that it’s all ethical. Where do you buy work tops that are: 1) natural fabrics and 2) possibly cost less than $50? Loft has been my go-to for years now (with sales and discount codes) but it’s time to upgrade. I think I saw on the main board yesterday that I should try J Crew again? 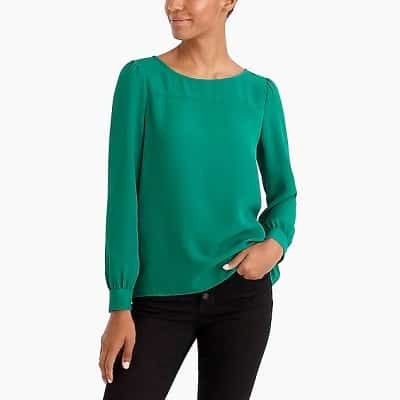 Love the Boden Carey Top (also known as the Boden Gathered Neck Top at Nordstrom in solids). Washable silk blend. I have it in two colors and wear at least once a week. Do you need to iron it? I got rid of my Ravello top because it was such a wrinkled mess every time I washed it, and I am not an ironer. Not the OP but my experience with the Ravello is that the prints camouflage wrinkles enough for me to wear them without ironing. I shake them out well and hang them to dry on a hanger. I think most of their silk/viscose blends will behave similarly, but I noticed they now have at least some poly shirts that probably wrinkle less. 257 Anon here – I am also not an ironer. If I were persnickety about wrinkles, yes, probably. If I had more patience or time (e.g., I don’t even blow dry my hair anymore except for special occasions) or a particularly critical meeting, I might take a steamer to it (the “my little steamer” works like a charm). My “quick” solution is to shake it and smooth it out once it gets out of the washer and then let it air dry on a drying rack. Second the anon above that the print polka dots camoflauge what limited wrinkles are left with my method much better than the solid. Question for you moms.. my husband and I are not parents yet but planning to try soon. We both drive sedans and have two dogs so have been talking about upgrading one of our cars to a larger crossover or suv. Does anyone have advice around buying a car around babies? Should we try to get the expense and stress out the way pre-baby or wait post-kid and hope it’s in the budget. Maybe this isn’t even such a big deal, but I imagine car shopping on top of first baby stress is a lot. It would be my primary car for whatever that’s worth. Both of our current cars at 10 years old but running fine. We will just run out of space rapidly with dogs and kids. So I bought a midsize SUV 1 month before I found out I was pregnant with my daughter, so it was a very welcome coincidence. In my case, we were just beginning to TTC, and I knew I wanted to upgrade my 10+yr old sedan to something bigger when baby came. The timing worked out where the auto show happened in our area, so we went and used that as a jumping off point to do car research and shopping. By the time baby came I was very happy I had it and had done it before my pregnancy – I just didn’t have my same level of energy during my pregnancy. The SUV has been great with hauling stroller & other gear, when we travel, etc. The only thing that sucked was trying to get in it to go home after my C-section.